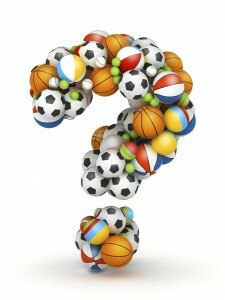 In part one of this post, I questioned the role of specialization in sports. I mentioned that many American parents encourage specialization over well-rounded development in the classroom and on the field. In other parts of the world, it’s not like this. Cedar Attanasio, who helps edit many of the posts on the Boosterland blog, shared this anecdote from his time studying in Hong Kong with Chinese and Cantonese students. Clearly, there’s a way to prepare young people differently. And, as I’ll discuss in a moment, quan cai might be a more appropriate theory of development for the modern job market. But it’s also worth noting that some educational systems go in the opposite direction. Europeans for example, often force teens to choose a career track by 16 to have any chance of succeeding. Many change their mind later and find themselves “too-late-in-the-game” by nineteen or twenty, when most Americans are choosing their majors. I thought Cedar’s example from China of academic well-roundedness was really interesting. Especially in contrast to a widely held view in the United States that other countries (including China) do invest heavily in athletes specializing. The most intense version of the “youth-sports industrial complex” might be the travel team. Participants double down on athletics with hours of busing around and thousands of dollars to do it. The first problem is inequity; a social division of athletes based on the wealth of their parents. And that probably deserves its own post. But the second issue is tunnel vision for these athletes. As I eluded to earlier, many sports are extending their seasons across the entire school year. Immersive summer camps are a logical step. With travel, year-round seasons, and summer camps, single sport athletes can eclipse their extracurricular experiences. On the road they can deepen their skills and their relationships with teammates. But they lose out on quan cai, and the balanced skill set that well-rounded development brings. Admittedly, I have a liberal arts bias, but I believe sacrificing a diverse skill set is poor preparation for many modern career paths. As the WSJ reported, the average worker will change jobs almost eleven times between ages eighteen and forty-two. Even if they are in the same industry, that means accommodating new teams of co-workers, new systems, and new ways of thinking. It’s not likely that today’s students will work in the same industry for long. Some have argued that the workers of the future will grace six or seven careers in their lifetimes. Even if the real number is much less, say two or three, you can see why I’m nervous to see students being diverse-averse. Training your mind and body to focus exclusively on the familiar doesn’t seem to make sense for the twenty-first century. In fact, professional sports are one of the few industries where specialization is choking out balanced development. Remember multi-sport athletes? They’re a dying breed. Here are just three of them that were amazing, and captured the imaginations of America and the World. All three of these athletic titans worked outside sports. 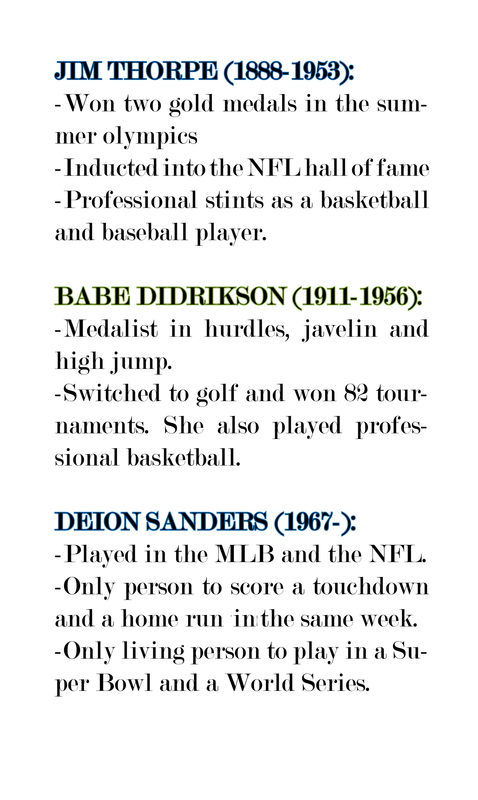 Both Didrikson and Sanders released music albums, showing that multi-sport athletes’ dynamism extends beyond athletics. There are still a few great multi-sport athletes out there, but fierce specialization is cutting them out of the competition. The last major athletes standing are those whose sports are complementary. For example, Sean White has conquered both the snowboarding and skateboarding worlds. Similarly, Lolo Jones has won medals in both sprinting and bobsleigh, which have complementary training regimens and seasons. For the same reason it’s important to pursue extracurriculars and get out of the classroom, it’s key to diversify the activities offered outside the classroom door. Students need to learn how to learn, not just follow the one activity that best fits their mental talents or their physical build. In life, there’s plenty of room for natural talent. So we do have to facilitate students delving into their passions, and that may mean specialization. But most jobs require a mix of skills, even the ones that we’re not as good at. As I mentioned in Part 1 of this post, breakthrough innovation often comes from the marriage of seemingly unrelated disciplines, like soccer and samba or environmental science and architecture. Every CEO has to learn a bit of public speaking, every poet a bit of marketing. I’ll repeat my questions from Part 1 of this post. Does your booster club have an official position on diverse activities? Do you invest more in facilitating no-cut policies at junior levels? Or do you invest more in improving the support for those who make the cut at the senior levels? It might be worth a chat at your next meeting. For parents: have you stepped back to think about whether you intend to encourage your kids to participate in multiple activities, or specialize in one? Although this post has focused on diversity, the best answer will certainly be different for different kids. Precisely because the answer will vary, it is worth carefully considering the options so you can make explicit choices.